I’ve been doing a lot of baking lately. (For humans, mostly.) I’m working on some quick breads that I can bake on a daily basis and I’ve been playing around with some cookie recipes. And you know what happens when you do a lot of baking. You do a lot of eating. So I looked at Saro. He looked at me. I said, “Why not?” and went to the Internet to find a recipe for dog biscuits. I already had the bone-shaped cookie cutter. 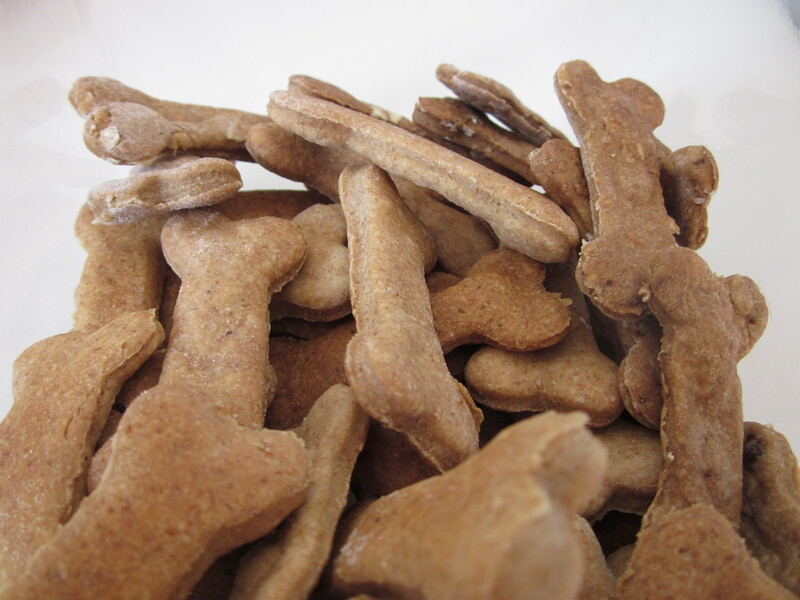 These dog biscuits are just about the easiest thing you can make. I made a batch over the weekend and plan to make many, many more. It seems silly now to buy store-bought biscuits. Plus, I get my baking fix without filling the house with a bunch of sugary treats. Here’s the recipe. I mixed this by hand, according to the recipe, but I think it can be done in the food processor too. I’ll try it next time. 1 Preheat the oven to 350 F. Combine oil, peanut butter and water. Add flour, one cup at a time, forming a dough. Knead dough into firm ball and roll to 1/4 inch thickness. 2 Roll out and cut into 3 to 4 inch pieces or use a cookie cutter. Place on an ungreased cookie sheet. Bake at 350 F for 20 minutes. Makes 2 1/2 dozen cookies.